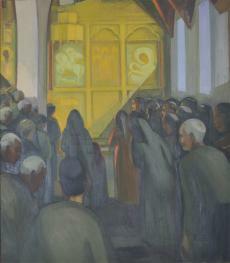 This piece was inspired by the artist’s plein air drawings, completed between 1942 and 1950. 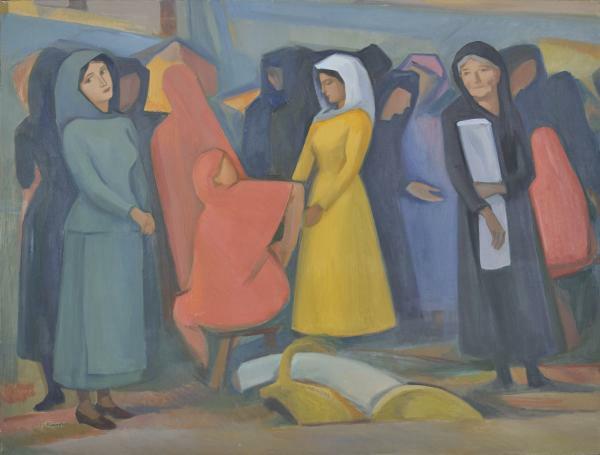 It depicts a scene from a traditional outdoor market, known as a ‘gynaikopazaro’ or a women’s bazaar, that took place in Nicosia on Fridays. Greek and Turkish Cypriot women from both rural villages and cities came to sell goods that they had made or produced themselves. In this piece, Kanthos wished to capture the atmosphere and peaceful character of the scene, focusing on the most important and basic features and avoiding descriptive allusions.